Enough, enough, we want no preachment – It’s time to vote on his impeachment! That rhyme from a Broadway classic, “Of Thee I sing,” words by Ira Gershwin, music by his brother George, comes to mind as talk of impeachment ricochets around Seoul – and Washington too. Credit the Gershwin brothers with having injected humor into politics – a topic that’s boring almost by definition. Generally, few of us follow the ins and outs of factional infighting, charges and countercharges, trials and punishments. Or, if we breeze through the headlines and a few paragraphs, we soon forget them before turning the pages or scrolling down for juicier tidbits, like murders, scandals and sports. 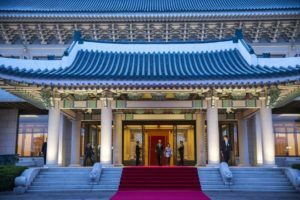 Neither South Korea’s ‘Blue House’ nor the White House provide a safe haven from those who would impeach their nation’s leaders. President Barack Obama and President Park Geun-Hye in Seoul on April 25, 2014. That’s by way of saying that suddenly politics is of more than passing interest in both the capitals where I hang out. Okay, comparisons never quite work, but surely the “I word” – I for impeachment, that is – has long since gained common currency in Seoul and Washington. Politicos and their journalistic sybarites and satellites are snarling at one another, regimes hang in the balance and hatred rather than brotherhood and camaraderie is the order of the day. “Of Thee I Sing” had audiences roaring in the early years of the Great Depression in the 1930s when a show about a befuddled, love-sick president provided much needed comic relief. Jokes at the expense of the leaders in Washington were ever good for laughs while millions of Americans were reduced to poverty. The political jousting these days may be no laughing matter, though daily stories about our leaders messing up do make fun reading. Someday clever writers will doubtless come up with satires on the dramas of American and Korean politics – that is, if the denouements are less than tragic. In Seoul and in Washington the “I word” won’t go away no matter how close it is to reality in Korea or how remote it seems in the U.S. with President-elect Donald Trump about to take over in seven weeks. President Park Geun-Hye might compare her dilemma with that of Trump, whose enemies are campaigning for his impeachment even before he takes office. Okay, try and dump me, let’s see if you can, was her message to the nation this week as a fractured, fractious National Assembly contemplates how to respond to the challenge. Obviously. a few million Koreans would love it if the assembly were to impeach her by the requisite vote of two thirds of its 300 members, but what if the motion fails? Or what if her foes, at each other’s throats to decide on a successor, decided they’d better wait before drowning in bitterness? Or what if the impeachment motion were passed and then the constitutional court, deliberating up to the maximum six months, said, no, she stays where she is. The possibilities are about as endless as those for Trump’s enemies trying to get him impeached as he stumbles through his first year or two in office. They’ll find endless excuses and pretexts, ranging from conflicts of interest between his sprawling business empire and the government he’s supposed to lead, to blunders that he’s sure to make as he tries to make good, or not, on his wild campaign promises. Don’t think Trump’s enemies are all going to give up on the impeachment battle just because Trump’s own Republican Party controls both houses of Congress – the lower house that votes to impeach and the upper house, the Senate, that’s got to approve impeachment. For one thing, although most of those Republicans who said, never Trump, are now cozying up to him, quite a few still don’t like him. Nor does Trump, having never run for anything before, have a wellspring of deep support within his party. A lot of Republicans don’t think he’s one of them. For another, we may be sure Trump’s enemies will be doing their best to bring charges that might stand up in court. Get him convicted, they’re saying, and we’ll get rid of him. The “I word” was common currency when Hillary Clinton seemed sure to win the election. Clinton’s foes loved to say they’d be able to impeach her after she was found guilty of abusing her rank and privilege by setting up her own email service as secretary of state. Now cries of “lock her up” as heard at Trump rallies are a memory. Trump has said he’s not going to pursue her legally while claiming “millions” of ineligible voters cast their ballots for her. What for? He’s still the winner even if a couple million more voted for her than for him. “Lock her up,” though, remains a theme in Seoul. If Park is forced out, if she steps down as she has promised after due deliberation by the National Assembly, she will no longer have immunity under the Korean constitution. That’s one reason for her to fight on while the politicians squabble and she remains safe from harm in her Blue House fortress. Donald Kirk has been covering Korean crises for decades. He’s at kirkdon4343@gmail.com.